File photo: A First Allied Savings and Loans branch. 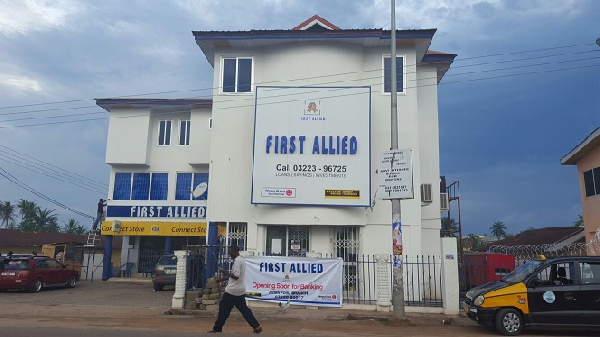 Customers of First Allied Savings and Loan in the Upper East Region are calling on the Bank of Ghana (BoG) to investigate the management of the Bank over its inability to pay its customers for the past three months. The customers on Monday besieged the Bolgatanga branch of the company demanding their unpaid investments. According to the customers, the situation is negatively affecting their livelihood, hence the need for the Bank of Ghana’s intervention. The banking hall of the Bolgatanga branch of First Allied Savings and Loans, which usually opens at 8:30am, was closed as at 9:25am. Hundreds of customers who have their investments turned up for their monies as promised them by the management, after three months of failing to pay them. Speaking to Citi News, the angry customers said they were not leaving the premises until the investments are paid. Another customer said, “last month, I wanted to close my account because of the way the manager talked to me. He promised to give me GHC1,000, but failed to fulfill the promise due to lack of funds. I came here for my money and if I am not getting it today, I want the government to intervene in this issue”. National Public Relations Officer of First Allied Savings and Loans, Jones Yeboah, said although management of the bank cannot tell when all customers will be paid, they were bent on resolving the matter. “I can’t even give you the assurance that those people we are going to give them their money, we can’t predict the date that everybody should come for their money after resolving the panic withdrawal. When you call all customers to come for their money you are collapsing the bank so we will resolve it gradually”.